The name, with its connotations of strict rules against dairy and meat products, may not thrill carnivores. 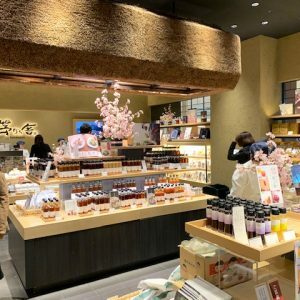 But the newest addition to Hiroo’s diverse array of eateries and shops may pleasantly surprise even the meat eaters. 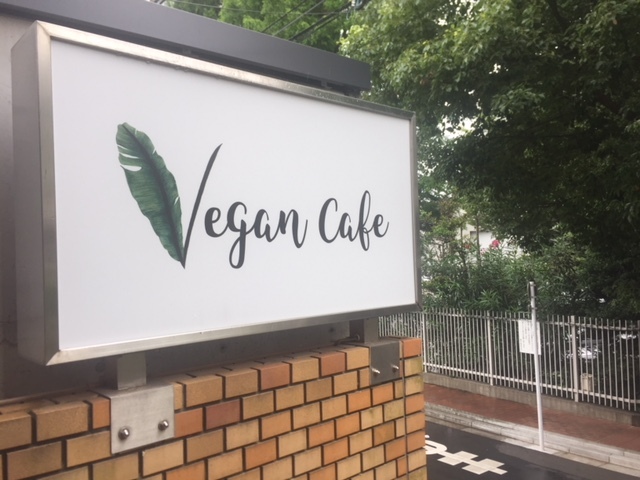 Vegan Cafe is perched up several stairs just two minutes walk from Hiroo station, on the right-hand side of the road leading from Hiroo crossing to Arisugawa Park. The sign is simple but inviting. Inside you find a light, airy room, with wooden furniture and potted plants. At lunchtimes, the star attraction is a colorful and abundant buffet featuring an east-west mix of vegan fare. 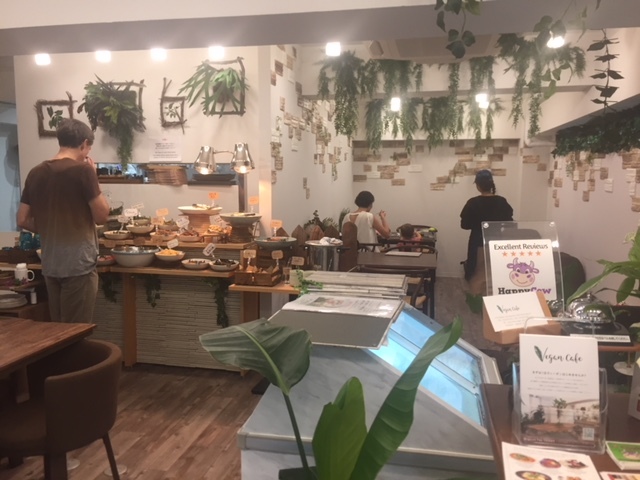 Vegan Cafe’s decor provides a close-to-nature feel. 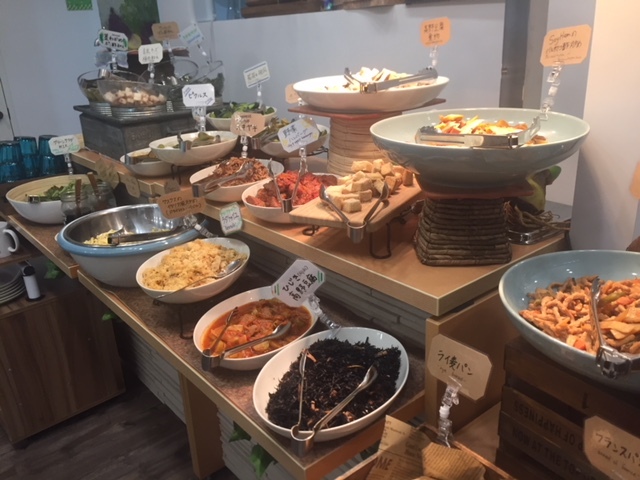 For Y1,560, you can eat as much as you want from an array of 15 or more dishes laid out along a broad side table, including large platters of salads, hot dishes including stews of beans and other pulses, and dishes made of “mock meat” using gluten or wheat cake and tofu. A tantalizing choice of dishes on offer during lunchtime. We enjoyed a hearty vegetable soup that was an intriguing combination of both western and Japanese flavors, a “sukiyaki” that looked remarkably like the classic thinly sliced meat-and-onion dish, vegan “hamburger” which resembled thick slices of meatloaf in a deliciously fresh tomato sauce, curried tofu and vegetables, and a variety of salads, both western and Japanese style. Vegan sukiyaki in the middle and vegan hamburger on the right. 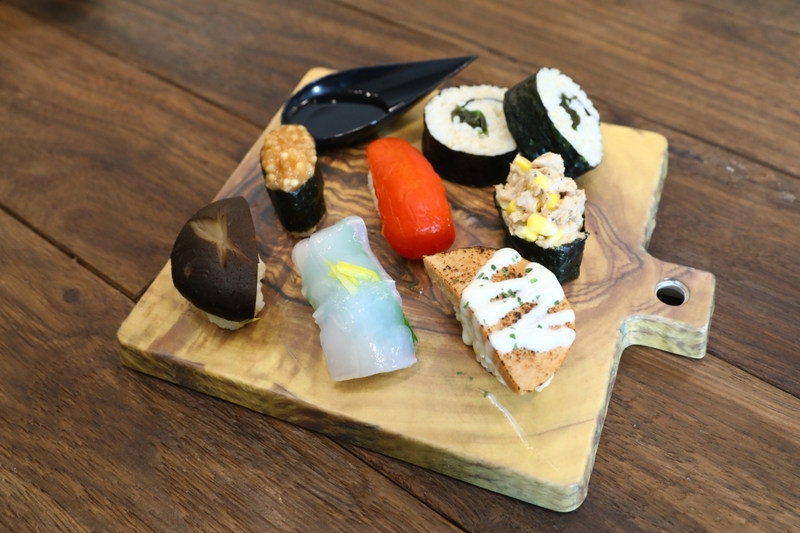 There are some traditional dishes such as a delicious hijiki seaweed salad made with the black, feathery seaweed mixed with shredded vegetables in a soy dressing, and more unusual dishes including a mild, Mexican style chilli dish that looked just like mince meat but was actually gluten or vegetable protein. Similarly a hearty stew that brimmed with what appeared to be chunks of meat was actually braised gluten and vegetables. The best compliment came from a carnivore friend who noted that “you don’t even have the opportunity to miss meat, you actually forget it’s all vegetarian.” Cooked as it is here in chunky, minced, sliced or shredded forms and in an array of sauces and gravies, from curry to tomato and shoyu, or soya sauce, the gluten has a meat-like texture but is more like a firm tofu, and similarly has little flavor of its own. 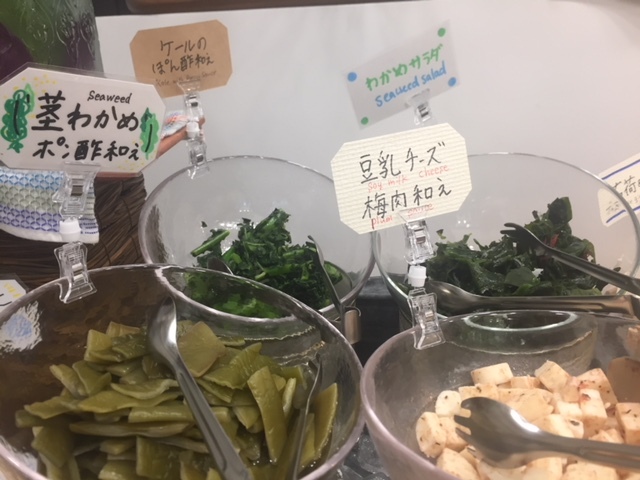 A selection of greens – (from left) seaweed stalk, kale and seaweed salad – and tofu cheese marinated in a plum sauce. 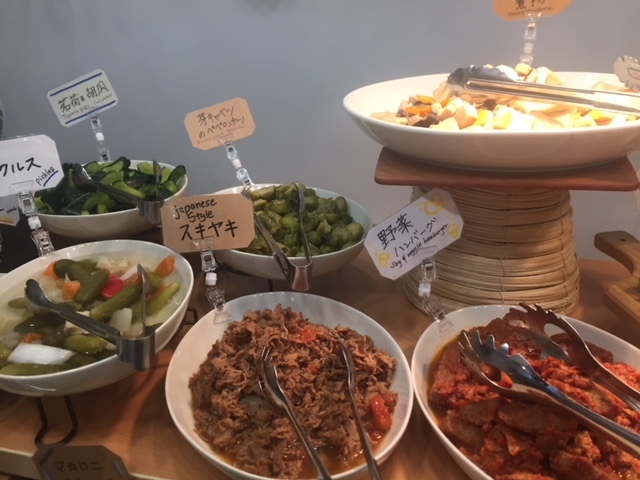 The buffet which runs until about 3:30pm (another plus) includes a choice of three types of drinks — potato tea, homemade lemonade, and (real) coffee, served if you want with soy milk. The potato tea is based on sweet potato, with a slightly sweet, earthy flavor, and is said to aid digestion and stomach ailments. 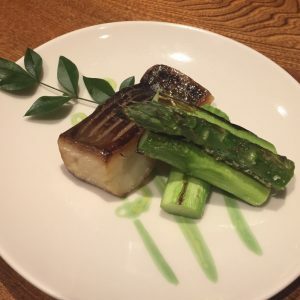 All the vegetables come directly from farmers, according to the friendly and helpful restaurant staff, and the menu changes every week. At night (go early evening as it closes at 9pm), and also on the a la carte menu, are other offerings including beautifully crafted “vegan sushi” in the form of nigiri (small rice balls) topped with paper thin vegetable slices such as peppers, daikon radish and aubergine; a vegan version of the Italian classic anchovy-based hot dip and crudité dish, Bagna Cauda; vegan paella; mushroom fettucine; and more simple fare such as hearty looking vegan burgers and baguettes crammed with eclectic fillings. A la carte desserts include rice-milk parfaits, deliciously light soya milk ice creams and sticky French toast. 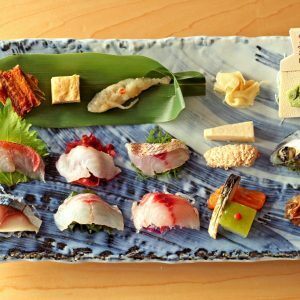 Japan has a long tradition of delicate, high-end vegetarian cuisine known as shojin ryori. This is not it. Rather, Vegan Cafe is about unpretentious yet creative, healthy and thoughtful fare presented with generosity and care. Whether you are vegetarian or omnivorous, the Vegan Cafe buffet has to be one of the best lunch deals around.